When a baptized child dies before reaching the age of reason, it goes at once to heaven to praise God and enjoy Him with the angels. Wherefore the Gloria Patri of the Psalms is not replaced by the Requiem aeternam, and the Mass is the Votive Mass of the Angels, with white vestments and Gloria in excelsis, unless the rubrics prescribe the Mass of the day. 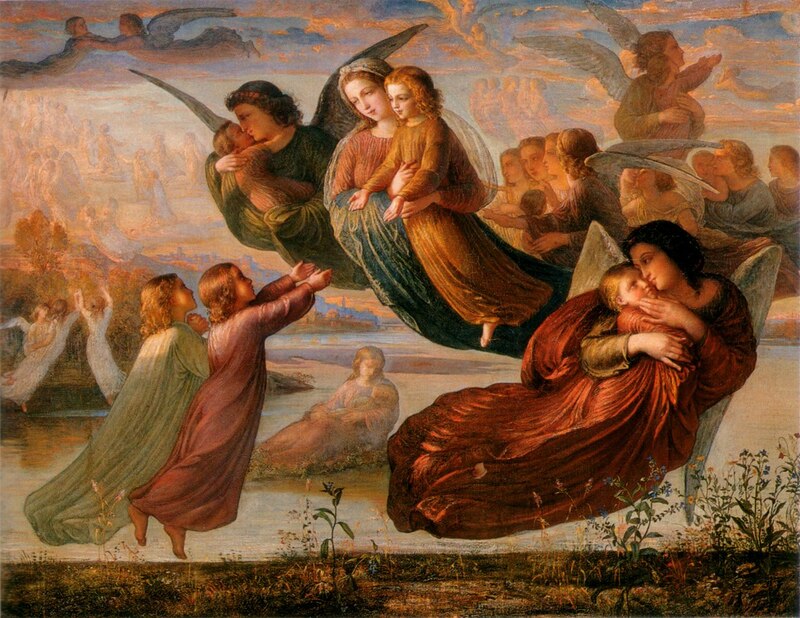 If in the afternoon, Votive Vespers of the Angels may be sung. I can’t remember when I first heard about this beautiful custom of not celebrating a Mass for the Dead or funeral Mass for such a little child, but rather a Mass of the Angels; it was probably a couple of decades ago by now. But since I had long been attending only university chapels and did not live near a traditional parish, no occasion like this had ever occurred. It remained theoretical knowledge. Recently, however, a little child died in our local community, and the rector of the nearby oratory of the Institute of Christ the King offered the Mass just as described above. I had the privilege of singing in the Choir. I found the entire thing extremely striking, and wish to share some thoughts on it, since this old custom has barely survived into the post-Montinian era. 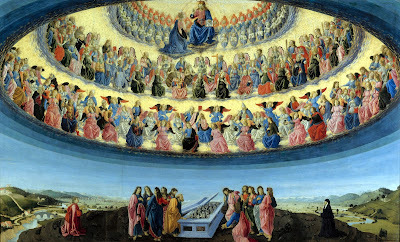 The first thing that must be said is that the old custom bespeaks a resolutely and audaciously supernatural perspective: when all are mourning the loss of a citizen of earth, the Church rejoices in the gaining of a saint in heaven. The Introit of the Requiem Mass pleads: “Eternal rest grant unto them, O Lord, and may perpetual light shine upon them.” The Introit of the Mass of the Angels exults: “Bless the Lord all ye His angels: you that are mighty in strength, and execute His word, listening to the voice of His orders.” Then the verse challenges us with an imperative: “Bless the Lord, O my soul, and let all that is within me bless His holy name.” We are told to do the very thing the departed child is now doing, whose soul, with all that is within it, blesses the Lord. The liturgical reform, monstrous in its rationalist leveling of every irregularity,  could not tolerate this sharp distinction between the lightsome angelic Mass for the child saint and the dark Requiem Mass for the adult sinner; in its baffling dullness of heart, the reform was blind both to supernatural realities and natural ones. The sable grief that follows the dead man weighed down with years, the urgent reminder to pray for the repose of his soul, the supernatural glory that surrounds a babe of days snatched from this world and thus preserved from the scourge of sin, temptation, vice, anguish, and all the ills that cling to fallen human life—such horizons of life and faith were closed off to utilitarian brains. The Montinian reform turned everything upside-down. It converted Requiems into informal beatifications, draped in the white of an Easter triumph presumed to be already gained, while suppressing the only instance where white vestments ought to be worn and alleluias and doxologies chanted, where heavenly glory may be joyfully, through a veil of tears, acknowledged as accomplished. The reform took away from the small child the Mass of the Angels that befitted it, and bestowed the honors of the altar on the old man to whom it was foreign, and who needs earnest suffrages for pardon and salvation. Salva me, fons pietatis! It took away this magnificent testimony of faith in a victory known to be won by a few, and substituted a pseudo-victory vainly extended to all. And why does the old liturgy exhort us, in the very presence of the child’s dead body, to praise the Lord — a sentiment that might seem out of place, to say the least? Here is where the eye of faith is more necessary than ever, to see what should be seen, and not to be clouded over by our frail flesh. The one and only ultimate end of man is the beatific vision. If someone attains this, he has attained the purpose for which he was created and redeemed. If someone fails to attain this, he has failed as a human being and as a Christian. Our final condition is either total victory or total failure: we have gained all, or lost all. There is nothing in between. The only “happy ending” is heaven, and the only “tragedy” is hell. The rest is relative. The baptized child who dies, although not granted by Divine Providence the relative good of life in this world, has been granted the absolute good of eternal life in the world to come. This is what all Christians say they desire: eternal life in God. This is the goal of our pilgrimage. And that is why Holy Mother Church, with her lofty and utterly realistic wisdom, clothes herself in white and sings the Mass of the Angels for the little baptized child who flies from this world, and sings with no less fervor the Requiem Mass, clad in black. Alleluia is the song of the lover and the visionary; the Dies Irae is the sequence of the worldly and battleweary. That such customs as these ever had to be swept away is part of the “mystery of iniquity” that surrounds the 20th-century Church. That such customs are beginning to come back is part of the mystery of Providence that surprises the Church of the 21st-century.